As I have already mentioned here recently, modelers in Toronto had during the past week unique chance to meet Mike Rinaldi, one of the most prominent (and my favourite) modelers these days and author of the popular TankArt Series of books. Those interested had a chance to see a presentation by Mike on his techniques or take part in one of the workshops organized by Hornet Hobbies store. I have of course not missed this opportunity and participated in Saturday’s workshop where Mike in few hours demonstrated his weathering techniques, focusing on pigments and hairspray method. In the first part of the session, Mike showed application of the pigments to lower hull and wheels of a tank using older Crusader kit. In the second part he used Panzer III turret in base grey coat to apply hairspray & chipping of the dark yellow coat and this was followed by another layer of chipping, this time by adding whitewash camouflage. It was great to watch Mike do the magic and have a chance to ask questions. I will not be speaking for myself when I say that these few hours were extremely helpful and I have added quite a few tricks into my repertoire. Many of the issues I have experienced in past have suddenly disappeared. You can read hundreds of articles on how to do the things, but watching the process was simply different kind of experience. Mike also brought two of his models – Stug III featured in the excellent book On Display – Stug III from Canfora Publishing and M26 Pershing recently presented in the second TankArt book (I did not realize, this was in the 1/48 scale…). 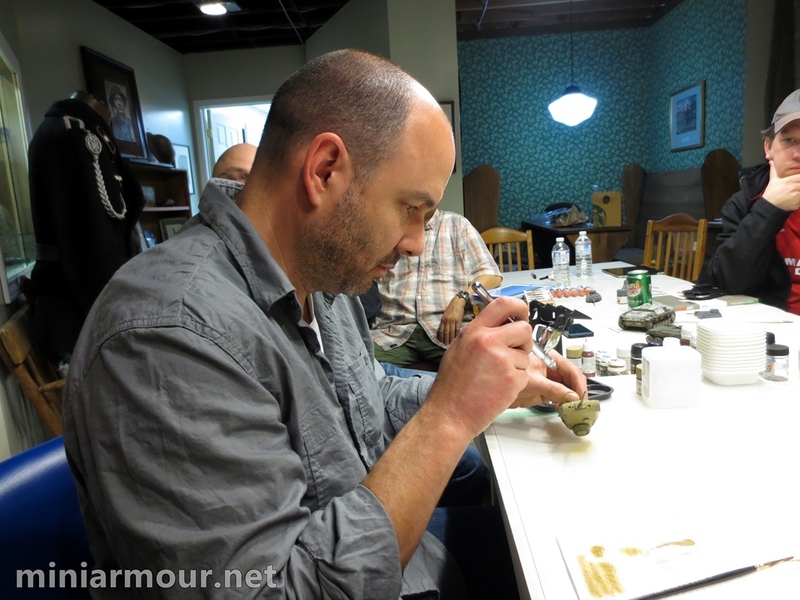 Thanks goes to Mike for coming to Toronto and sharing his secrets, I hope this was not his last visit here and of course to Dave Brown of Hornet Hobbies for organizing this excellent event. In addition to the pictures, I have also shot few short videos, which I will be adding here as soon as I can figure out how to do it. Wow that’s some mighty fine weathering. Nice photos!